103 women of Umuanuma community in Nguru, Aboh-Mbaise Local Government Area of Imo State, gathered on February 16, 2018 for a one-day community outreach on fiscal justice and community organizing. 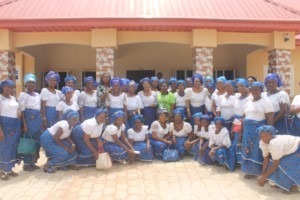 The outreach designed to empower members of Umuanuma Women’s Association (UWA) had three primary objectives: to educate on how to organize themselves to advance their community developmental objectives; how to demand for improved access to social services and amenities (hospitals, schools, housing) and how to track the Imo State budget especially the delivery of housing infrastructure for residential and commercial purposes. Dressed in their Association’s uniform comprising traditional blue wrappers and white blouses, over a hundred women thronged the meeting venue. The event kicked off with a training session for UWA executives. The executives had requested Spaces for Change | S4C to build their capacity to organize effectively in order to advance the empowerment of their members and attract support for community development from home and abroad. In December 2017, UWA completed a community health center project it built for women and children in the community, and now needed both financial and managerial resources to effectively run the health center for optimum performance. S4C’s executive director, Victoria Ibezim-Ohaeri facilitated the training for the executives. The training centered on the rudiments of community organizing: leadership, constitution drafting, the procedures for legal registration, developing a management structure and organogram, fundraising techniques and so forth. 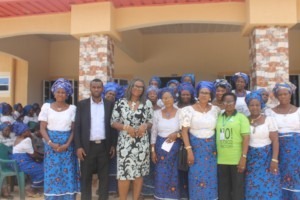 The women asked several questions especially bordering on the conditions and procedures for registering the new health centre with the Corporate Affairs Commission and under the relevant departments of the Imo State Ministry of Health. The second segment of the workshop kicked off with another training session on housing budgets. Facilitating the session, S4C’s Legal Officer, Mr. Kingsley Ogam–Okafor explained how state governments design and structure their budgets, and consider capital projects to be included in the state annuals budget. The women learned about the size and structure of Imo State’s housing and public infrastructure budgets from 2010-2017, and how they have been applied. S4C has been analysing Lagos and Imo housing budgets to map out the budget shares for low-income housing and the potential beneficiaries of state housing programs. Participants also learned how they can ensure their community priorities – such as equipping the new health center – can be captured in the state budget. Some of the steps highlighted include approaching state authorities under an organized umbrella body to present their demands formally and informally, whether by means of letters, petitions, stakeholders, dialogue, town hall meeting etc. How can women organize themselves effectively to advance the empowerment of their members and attract support for community development? This was the focus of the third session facilitated by executive members of the Community Alliance against Displacement (CAD). The group consists of leaders of marginalized and displaced communities in Lagos working together to tackle forced displacement and the critical challenges of inadequate housing confronting impoverished slums and informal settlements surrounding the margins of Nigeria’s cities. CAD executive member, Mrs. Williams Olabisi explained how CAD was formed, and its metamorphosis into an umbrella body connecting slumdwellers in Lagos State. The group which started with only four community associations now boasts of the membership of about 24 informal communities across Lagos State. She shared experiences regarding how new communities were enlisted, the challenges that they faced and the nature of advocacy activities that CAD undertakes in its member communities. 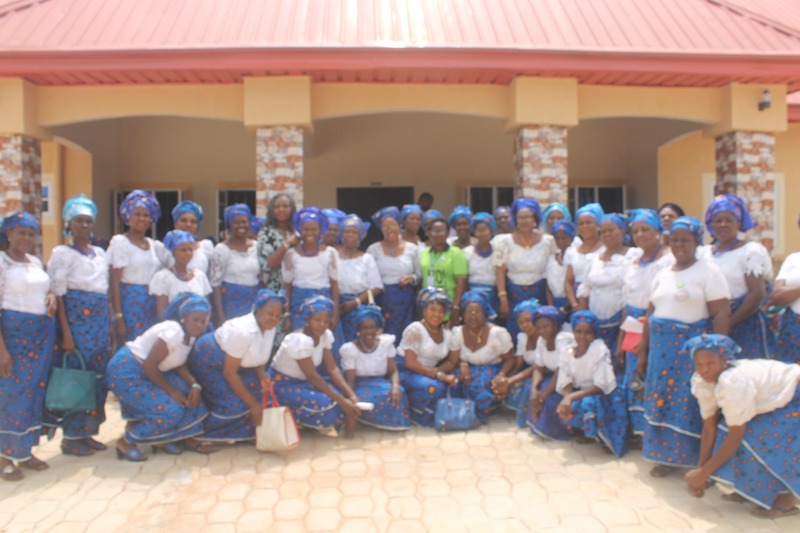 She enjoined the women to stay united and cohesive in order to reap the benefits that come with organizing effectively for community development. Participants had many questions to ask. Where can we find lawyers to undertake legal registration for our community health center? What do we do if the government does not respond favorably to our demands? Where else and how can we locate the resources we need to run the health center? How can we make our members become more active? Can S4C assist us to draft petitions to government? Where can we access cheaper medical personnel? And lots more. For over an hour, S4C and CAD executives answered a variety of questions during the final session. There was an incredible excitement among the women after the program. UWA President, Barrister Mrs. Florence Ohanu, thanked S4C for organizing the illuminating outreach in their community. She stated that they have learnt important lessons that will enable them make a lasting impact. By working with local women, S4C is determined to take its advocacy to women in harder-to-reach localities, equipping them with the tangible skills that they need to make a difference in their communities.